I’ve been pondering the whole “War on Christmas” discussion for some time now. I haven’t been able to quite get my head around it. To my sociological brain, the whole idea of saying “Happy Holidays” came from two sources: 1) the mashing together of shopping seasons from September through February, and 2) a recognition that religious pluralism means that I can’t assume everybody is like me. Reason one reminded me of Irving Berlin’s Holiday Inn. 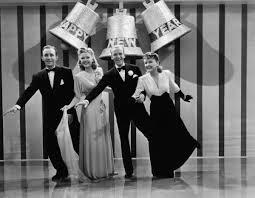 Fred Astaire owns an Inn that only opens for Holidays and does Broadway-type shows. It makes lousy business sense but it gave lots of excuses for song and dance numbers involving Fred, Bing, Marjorie Reynolds, and Virginia Dale. It predates White Christmas, but uses the same house and Bing sings The Song here first. (If you watch it, be forewarned, there’s a pretty offensive blackface number somehow celebrating Lincoln’s birthday). But I still wonder why people would travel to this quaint Inn to see the song-and-dance. Why do we care so much about our holidays and what they’re called? Why do we privilege OUR holidays and minimize other people’s holidays? Why is Rosh Hashanah on my monthly calendar if it’s somebody else’s celebration? See, a recognition of pluralism would mean that we’d acknowledge that there are other views alongside our own. We know that immigration from a variety of nations has increased our awareness of other celebrations. In fact, we can even interpret the rise in “religious nones” to be an expression of that very diversity. Even before Megyn Kelley’s “terrible horrible no good very bad day” yesterday, there were forces pushing back against recognition of diversity. Monday, the Oklahoma legislature introduced a “Merry Christmas bill” that would allow schools to have Christmas parties and Christmas trees (as opposed to those dreaded Holiday events). They express the kind of sentiment Jon Stewart skewered last week: How can I enjoy my Christmas when I know that somewhere a little Jewish boy is not being forced to sing “O Little Town of Bethlehem”? There are plenty of similar stories. Also in Oklahoma, a private group paid to display the Ten Commandments in a public square. Looked like a neat end-run around establishment clause issues. Then a group of satanists said that they were going to have a private group put their own monument up. I learned last night that someone put up a Seinfeld Festivus pole in Florida (I guess that got Gretchen Carlson going). Today, a federal judge (who is a graduate of Pasadena Nazarene College and a conservative) ruled that the cross at the Mount Soledad cemetery has to come down. It’s bound to launch all kinds of rants about liberal justices destroying the Christian foundations of our society (which, according to James Dobson, is somehow related to Sandy Hook). In the midst of my struggle to make sense of holidays and pluralism, a tweet by Rachel Held Evans gave me one of those “light bulb” moments of clarity. Responding to the whole “of course Santa and Jesus were white” discussion, Rachel’s tweet said that the critics were people “for whom civil religion has become an idol they force everyone to bow to.” It’s a great Daniel reference, but my realization was that all this stuff about “Merry Christmas” is less about “Keeping Christ in Christmas” as it is about protecting our national sterilized religion of exceptionalism, providence, and manifest destiny. Robert Bellah introduced the idea of civil religion in the late 1960s, drawing attention to the ways in which national identity operated in ways similar to traditional religion but without much content. In fact, his original essay includes this famous quote by Eisenhower: Our nation makes no sense unless it’s based on a deeply held religious faith, and I don’t care what that is (emphasis mine). In that quote rests the heart of civil religion: a vague idea that cannot be examined because the minute we seriously interrogate it, it vanishes in a puff of smoke. This is a major difference between Christian faith and civil religion. As we have proved in the church over and over and over again, we debate differences in theology, practice, polity, liturgy, baptism, creation, and biblical interpretation. We blog and write books and have conferences that support our position against the other guy (or girl). But on our best days, we are still aware of the concept of the Church as the Bride of Christ. We hold to our positions and the reasons for holding them but we operate from faith not from certainty. That’s what allows me to have friends from a variety of theological traditions. We can see things differently and engage in our twitter fights and critique each other’s strategies or political positions, but at the end of the day we retain a commitment to the Invisible Church. Because we live by faith. As Frederick Buechner says, “doubt is the ants in the pants of faith”. This comfort with doubt is what’s missing in civil religion. Because it exists at such a generalized level, it can’t be argued. We can’t find ways of parsing the different strands and still holding to commonality. The mythology of agreement (like a notion that Santa is white or that Jefferson was an evangelical) MUST be maintained because without the mythology we have nothing. If we admit that these other holiday traditions are valuable or even that people can go through life and not celebrate ANY holidays, then what can we take for granted as a society? We’d be forced to confront our differences and learn from each other. But those risks are too great, so the celebrants of civil religion (politicians, pundits, and some preachers) can’t allow anyone to stray from the party line. It’s not a belief system as such. Just an affirmation held together in brightly colored tissue paper. When that paper tears, as it will like all the Christmas (or Hanukkah and Kwanza) wrapping, what then? Then, just maybe we in the Christian church can teach our fellow citizens how to explore differences without abandoning faith. To show them that there is something deeper and richer and more real than what they’re trying to hold onto. That change isn’t scary when faith abides. We don’t always get that right. But I think at the root of our faith, we understand that doubt isn’t a scary thing. It actually takes us to the places we needed to go.